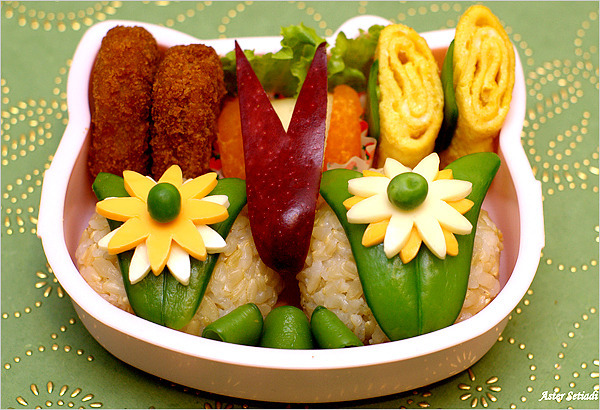 Bento Boxes Article – So Cute! The New York Times ran an article about bento boxes, the Japanese style lunches in a box that seem to be gaining popularity with families in America. Talk about having fun with your food! If ever there was someone who would appreciate his food being prepared this way, it is Tawn. Maybe that’s how I should start preparing his dinner? This entry was posted in Uncategorized and tagged Bento Boxes, culture, Japan by christao408. Bookmark the permalink. Try it out; I’m sure it would be fun surprise for him. Ohh I am a fan…! How cute is that – and very tasty from the looks of it…. 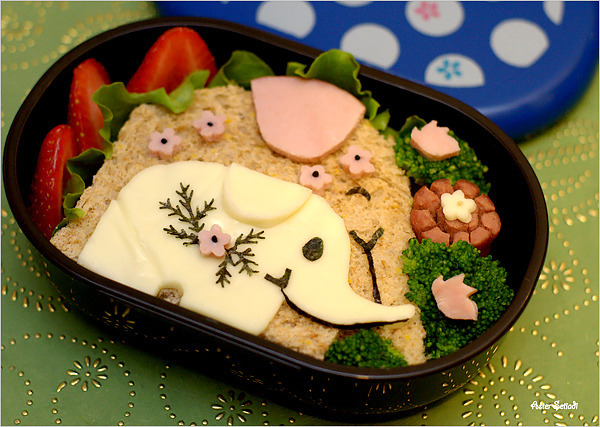 How about starting a Thai bento box…with carved food resembling lotus flowers and orchids and an elephant too? Lunch for four would have been waaaaay too time-consuming! These are too cute! I have a cook book for toddlers that has this kind of stuff in it. Of course these look much nicer – and tastier too. OMG! This is so cute! But, I am afraid I wouldn’t ever eat because they are so cute to look at! haha….the Art of Japanese Bento Box… I guess they will also have some kind of Bento box decorating competition in Japanese too……. Growing up some of my friends have bento boxes like that and although they look great, I sure loved my oversized, densely-packed bento boxes more >:DYes I grew up eating that much haha! Try it! They’re adorable and there is so much that you can do with them. I’m not sure I’m artistic enough to make one myself. I need to send you these bento box blogs then! I have a whole storage box of bentos. Too bad no one will lovingly prepare cute meals for me like you and Tawn. @minhaners – I read some of those bento box blogs mentioned in the article. There’s a niche for everyone, huh? @marc11864 – Healthy food being interesting. Who would have thought? @devonferris – If only the boxes of food on airplanes were nearly so interesting. @TheCheshireGrins – I’m neither artistic enough nor inclined to spend the time. There was a “twist cut” that one bento box site demonstrated that was interesting, though. @yang1815 – Why limit yourself to one bento when you can eat four? @kunhuo42 – @agmhkg – Yes, the article was talking about the intense competition that Japanese mothers feel to make the best bentos. @tdalch – @Dezinerdreams – @Redlegsix – This is the problem, I think. You find the food so cute and the design so fascinating that you end up not wanting to eat it! @lcfu – Bento definitely is a type of art. @murisopsis – If you have a child who is fussy about trying new things, I guess this would be a fun way to entice them. @XXKimPossibleXX – Can I do it and post the tips? Ha ha! There are some things I just don’t have enough time to learn to master. This is one of them. @stebow – Can you imagine how much time it would have taken? @ZSA_MD – Perhaps you should take this up as a hobby instead of golf? =)@Wangium – Want me to suggest this to your BF? @Jillycarmel – I just thought of an idea for Prairie Home Companion: Lutheran Women’s Fellowship Bento Boxes! @CurryPuffy – What with all the vegetable carving we do here, a Thai bento box would be a fantastic idea. @Roadlesstaken – Of course, he reads my blog so I guess it wouldn’t be much of a surprise. He’s probably sitting around wondering where his bento box is…@venice – They say we eat with our eyes. Must be especially true with bento boxes. That was a VERY funny response Chris. I needed that. May be I should. Where can I buy one of these Chris? I assume they are available in any Japanese Market? I gotta find one around my area then.